Halftime Augie 43, SCSU 42. Dougie earning his seat at the post-season banquet tonight. Funny, I would contend that just as many of his calls have been frustrating as an Augie fan. A much better overall performance for MSU tonight. Apparently Baumgartner (the Mav one) was injured or sick, as he did not play. Oh good Lord. I hope your not driving tonight. Between the two of us, I think we know which one knows a thing or two about officiating. moorhead wins 75-71. Led from start to finish but couldn’t put USF away as Evans is really good. Not sure if it’s evans or Davis for POY. Coin flip. Msum stays in n conversation for post season. Huge weekend at home next weekend with scsu and Duluth coming to town. 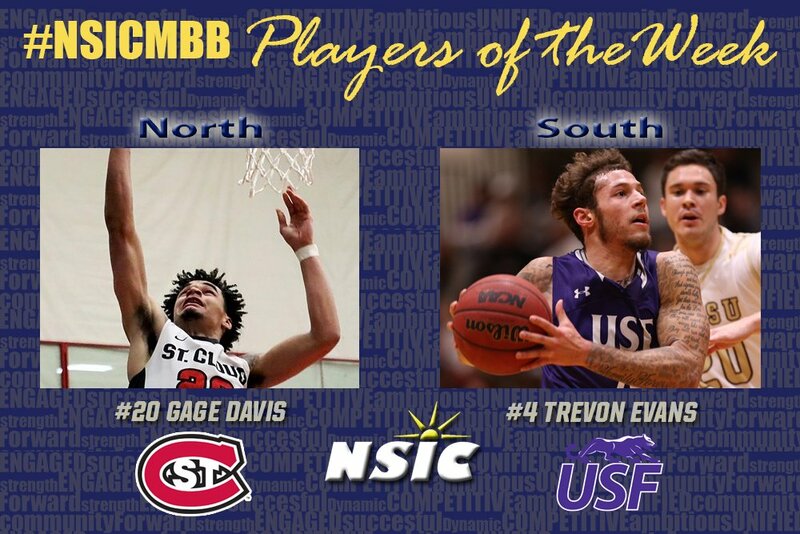 Just sitting here waiting for the nsic to try and not give this weeks POW award to Gage. SCSU only split, so they will have their justification. Well, without checking stats, I vaguely recall that Gage missed one of the shots that he took in Wayne, so there is that. At least one miss, so no POW for you. I assume on Saturday he abandoned whatever astral plane he temporarily occupied and returned to the mortal realm which allowed Augie to squeak by. More seriously now, this is gut-check time for Wayne. The entirely excusable Friday loss was followed up by the far less excusable Saturday loss to Duluth. The team just looked dead tired. Body language was bad on a few players. Immediate (and sometimes justified) complaining about calls that didn't go their way. Guys mostly were on task in terms of assignments but the defensive intensity wasn't quite there like it was earlier in the year. Wayne isn't going to out-shoot much of anybody so to win they have to get back that intensity, mojo, whatever you want to call it. They have met the Wall, and they hit it pretty hard. Now they gotta persevere and climb over it. I agree. They just looked tired on Saturday and Duluth simply out hustled them. Gage committed the most fouls of anyone in the game on Saturday. What sort of message would we be sending to the kids if we promote that kind of malfeasance? Eh...if you are wishing to climb the regional rankings you could just as easily be wishing we beat Mankato this weekend. Plus you have your own big weekend task ahead guarding Mr Davis plus the suddenly hot Duluth bunch to worry about. Nothing wrong with scoreboard watching but the regional semi-contenders are so closely packed together at this point that nobody really knows who to root *against*. Should be the NSU womens trenchcoat gang for causing Bruggy to miss THREE fts in a game. I'd be shocked if that's ever happened to him. Agree. My wife got a kick out that (the trench coats, not the Bruggeman part). Fair enough...feel free to beat Mankato then hit the Wall...and you are correct there is more than enough competition heading to Moorhead this weekend. Hoping northern beats Duluth in triple OT on Friday.